I recently spent about a week housesitting for a friend of mine in Calabasas, California, which is just west of the San Fernando Valley. That is, near Los Angeles. For those of you who are familiar with the greater Los Angles area, I was just on the other side of the Santa Susana Hills, west of the Valley, in Las Virgenes Canyon, north of the 101. And by "the Valley", I mean the San Fernando Valley. I lived there in the 1980s and always thought that it was funny that although there are a LOT of valleys in California, there is only one "the valley". I lived in Canoga Park, which was just west of Van Nuys. You know, the Valley - like Valley Girls, etc. 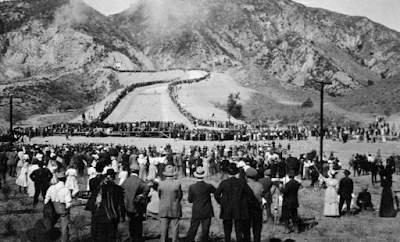 If you know your California history, you know that communities like Van Nuys were annexed to the City of Los Angeles after the Owens Valley Aqueduct was completed in 1913. In fact, that's the story of political power in Los Angeles - whoever controls the water, controls the political power. Now, waitaminute, don't get all confused with fictitious stories about water in Los Angeles. Yeah, there are great books, and movies, like "Chinatown", but that's fiction. Sorry, the real story isn't filled with excitement and intrigue, it's just about a place that was dry and dusty and in need of a steady supply of water at the turn of the century. Yep, just real estate. Well, maybe real estate is exciting to you! It certainly made a lot of people a lot of money! 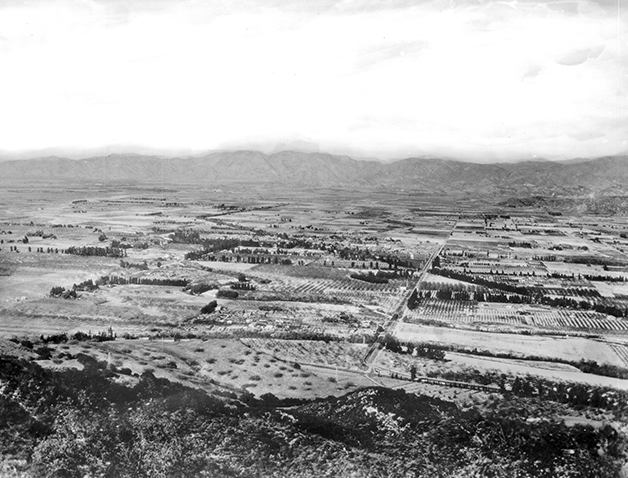 Before 1913, only crazy "desert rats" lived in the San Fernando Valley. Sure, little towns were there, like Canoga Park, but they weren't exactly thriving places - more like little rat holes. Just think of any place way out in the middle of nowhere, with no steady supply of water. People live in these places, but not many. And there were farms there, but it was tough going without a steady supply of water. 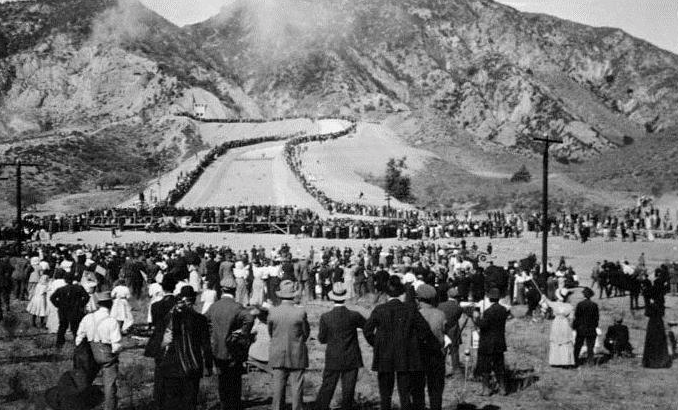 When the water flowed over the Cascades in 1913 and city of Los Angeles Engineer William Mullhollad gave his famous speech ("there it is, take it"! ), everything changed overnight. Isaac Van Nuys didn't live to see the change. He died in 1912. The farmland he owned changed into suburbia just about overnight. So the story of Van Nuys is the story of all of the small towns that were annexed to Los Angeles. They really aren't their own towns, they don't have their own mayors and their own police forces. But they have stubbornly held onto their names, and it gives people who live there a real place of identify. If you lived in places like Canoga Park, or Van Nuys, you know what I mean. Even after over 100 years, it's still not Los Angeles to the locals! 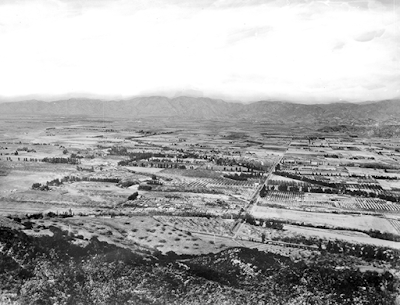 Image at the top of this post: the San Fernando Valley in 1909. Morty: Can you believe it? We're in the middle of a drought, and the water commissioner drowns. Only in L.A.
Hi Mick - yep, the movie Chinatown - blurring the history of water in Los Angeles since 1974! 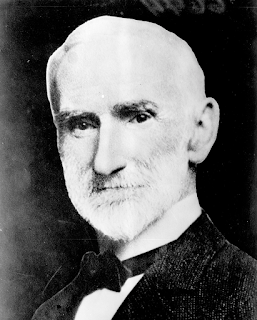 William Mulholland died in 1935, at the age of 80, 22 years after the aqueduct was built.